Photo courtesy: Scripps National Spelling Bee's facebook page. 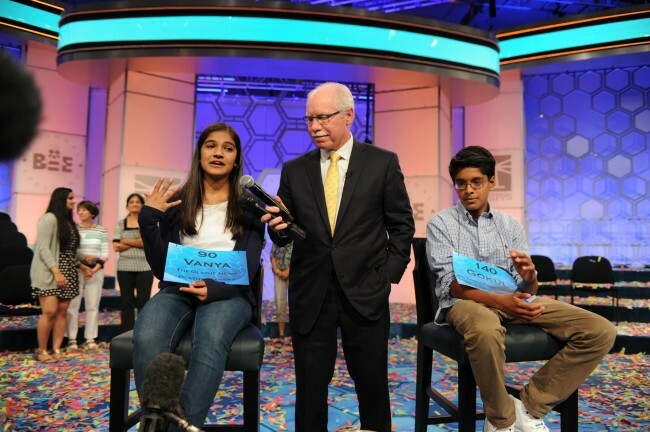 Washington, May 29 (IANS) Two Indian American students have jointly won the Scripps National Spelling Bee competition. Vanya Shivashankar, 13, of Olathe, Kansas, and Gokul Venkatachalam, 14, of Chesterfield, Missouri, were declared co-champions on Thursday night, CNN reported. Vanya correctly spelt ” scherenschnitte” and Gokul did likewise with “nunatak”. In this year’s national championship, 285 spellers competed for the title. Vanya, an eighth grader at California Trail Middle School, has competed in the national bee four other times. Last year, she tied for 13th place. Her older sister, Kavya, was the 2009 National Spelling Bee champion. Gokul, an eighth grader at Parkway West School, came in third place in last year’s competition. After his victory, Gokul said the competition was a culmination of six years of hard work.